Hi, everyone! I know it’s been a little while, and I have recipes piling up that I want to post here, but time has not been on my side lately. It does seem to be that way during this time of the year, doesn’t it? If you bake on a regular basis — gluten free or not — then you know how quickly ingredients can fill up your cabinets and pantry. And if you bake gluten and sugar free, then you might find yourself in my situation, with over a dozen different types of flour plus several sweeteners stuffing your shelves. Things got so confusing and unkempt looking in my cupboards that I found myself not wanting to bake as much because I knew that I’d have to sort through ziploc bags full of who knows what in order to find what I needed. Not fun! On a recent Sunday afternoon, I finally had it with the mess, and I went out and purchased snap top containers for my ingredients. I made ingredient labels to go on the containers, and my cupboards are now full of ultra organized and labeled flours and sweeteners. For the first few days after I organized, I couldn’t stop opening the cabinet and smiling because everything was so much easier to find. I plan on keeping it this way! The free printable ingredient labels (445 Kb PDF) include 27 different flour and sweetener labels in a rainbow of colors. For those who may not be interested in the colors that I chose, and for those of you who don’t use these types of ingredients, I’m also providing a sheet of printable blank labels (529 Kb PDF) that you can use as ingredient labels, gift tags or labels, food labels, and more. 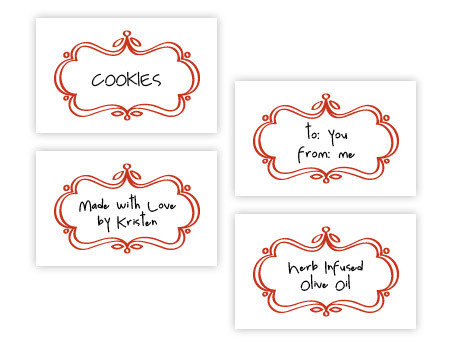 I made the blank labels a deep red for a Christmas-y feel, but if you have a graphic editing program like Illustrator or Photoshop, then you can easily change the colors to whatever you’d like. The font I used is Luna, which can be found for free at DaFont. You will need the Adobe Acrobat Reader to download and use these files. Download the reader for free here. These labels are for personal, non-commercial use only. Thank you so much for sharing these cute labels!!! These are so lovely – really like the idea of using them as gift labels – thank you for going to all that effort and sharing them with us! Perfectly beautiful! Thanks so much. PS get on Twitter! Wow, perfect timing! I’ve been on an organizing rampage tonight and I was just about to start on the pantry. Glad that you’re enjoying the labels, everyone! Ann – I do have Twitter accounts for my other sites. Will have to consider opening another for Domestifluff! Kristen I’ve just used these as my labels and they look fab! I’ve referenced them back to you too (cos I’m definitely not that good on AI!). Love these — thank you! Love this idea so much more than my sharpie labeled ziplocs. Thank you! Wow! I have no idea how I stumbled upon your blog, but I am so hooked!! It is such a relief to me to find gluten-free (and sugar-free, why not?) recipes on-line. I’ve gotten pretty good at improvising, but this will take some of the guess work out of it. PLUS, I get crafty inspiration, too???!!!??? PS: I’ve often heard that gluten-free flours should be kept in the fridge. Is that incorrect? PPS: There is a cookbook called “Extra-vegan-za” that someone highly recommended to me (apparently, there are excellent gluten-free recipes in it). Have you tried any recipes from it? Any thoughts? I’m so happy to hear that I wasn’t the only one with ziploc bags full of assorted gluten-free flours. Mine would tumble out of the freezer every time I opened it! These labels are so cute! I’m a gluten-free crafter too!!! How exciting! The best….i looked all over ..and these are AWESOME!! Is there any way in which I can print my own words onto these labels? I have saved the file onto my desktop, but cannot see any way in which to edit. i´m sister´s bride from brazil, tottaly mad about the planning of bridal shower. 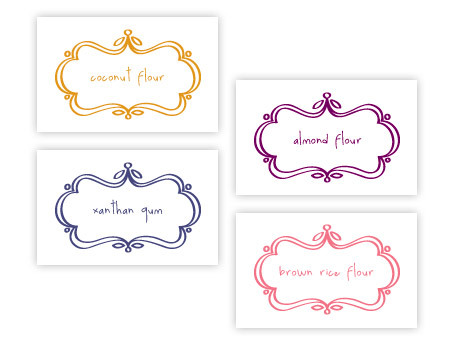 I was crazy, looking foward for this kind of printable food labels!! Thanks a lot for sharing with us!!! Great work and thanks again.. These are so cute and uesful! Thank you for sharing.